Product prices and availability are accurate as of 2019-04-21 03:03:26 UTC and are subject to change. Any price and availability information displayed on http://www.amazon.com/ at the time of purchase will apply to the purchase of this product. 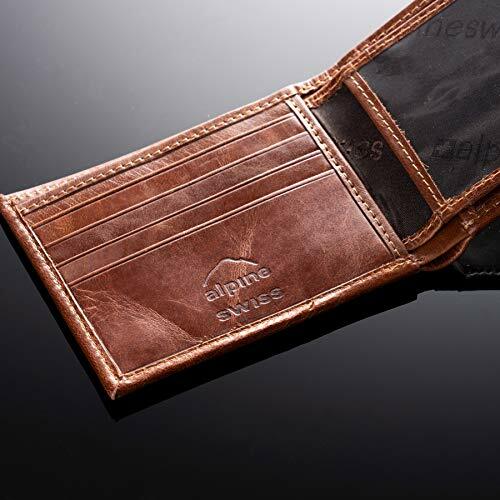 RFID Blocking Center Flip Bifold By Alpine SwissProduct Features: Genuine Leather CLASSIC DESIGN - The RFID protected multi-card bifold wallet features a classic bifold silhouette that measures: 4.25" x 3.37" x 1". 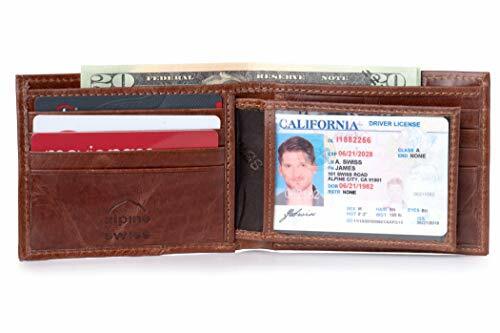 ADDED CAPACITY - This spacious wallet was designed with one fully lined bill section, a convenient center flip with one ID window, and a total of 10 credit card slots. 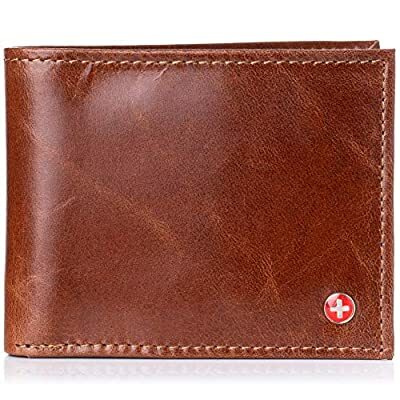 DURABLE & STYLISH - Crafted from the finest quality genuine leather, this wallet is durably rugged yet buttery soft. Available in a variety of colors, we have the perfect wallet to match your personal style. Front is accented with signature Alpine Swiss emblem. A PERFECT GIFT – Comes neatly packaged in Alpine Swiss giftbox. RFID PROTECTED: Certified independent lab tests in Met Labs Santa Clara, CA facility. Secure your personal data for credit card RFID chips operating at 13.56 MHz frequency while allowing use of 125 KHz proximity cards such as ID badges, hotel cards & some transit cards. 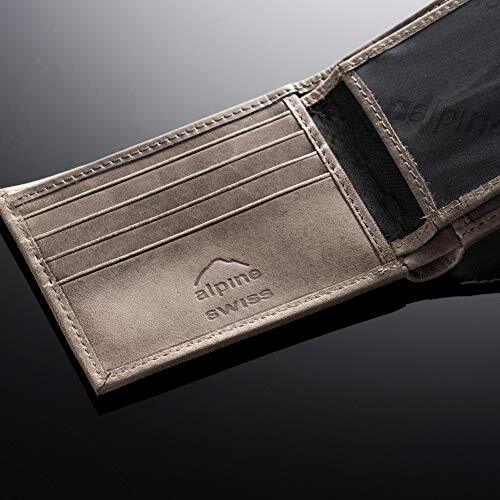 MSRP $75.00 Alpine Swiss donates 2500 meals every day to hungry children in the U.S. and around the world through our partnership with Children’s Hunger Fund. These meals are hand delivered in a Food Pack, which will contain enough food to feed a family of 4-5 for a week to the homes of the needy by trained volunteers in their community, establishing relationships that foster genuine care. Your purchase fuels this effort! Thank you! 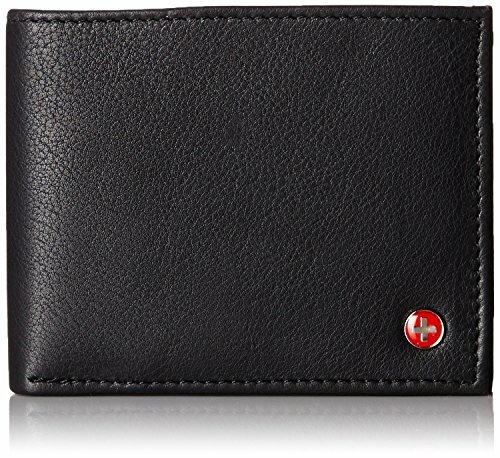 CLASSIC DESIGN - The RFID protected multi-card bifold wallet features a classic bifold silhouette that measures: 4.25" x 3.37" x 1". 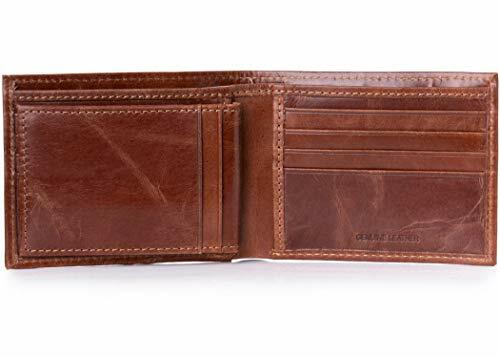 ADDED CAPACITY - This spacious wallet was designed with one fully lined bill section, a convenient center flip with one ID window, and a total of 10 credit card slots. DURABLE & STYLISH - Crafted from the finest quality genuine leather, this wallet is durably rugged yet buttery soft. Available in a variety of colors, we have the perfect wallet to match your personal style. Front is accented with signature Alpine Swiss emblem. A PERFECT GIFT - Comes neatly packaged in Alpine Swiss giftbox. RFID PROTECTED: Certified independent lab tests in Met Labs Santa Clara, CA facility. Secure your personal data for credit card RFID chips operating at 13.56 MHz frequency while allowing use of 125 KHz proximity cards such as ID badges, hotel cards & some transit cards.